Yelp isn’t just a tool for finding a local restaurant. At least not in the hands of a private investigator. How do you background people using Yelp? Find their friends. Identify a user name that can be searched at Google or other social media. Locate where they’ve lived or vacationed and the dates. Build a profile by culling personal information from their reviews. People don’t always display their full names so you have to use additional search criteria to develop that. Sometimes they list their town and state. You can cross reference that to verify their identity. I looked at the older Google Street View image, which corresponded to the date of the pizza comment, in case the business name had changed. 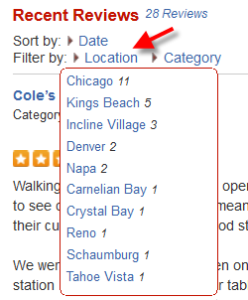 In the Yelp profile, select “reviews” under the person’s photo, then click on “Location” to see the places where this person has been. She’s from Denver and lived in Chicago from 2009 to 2011. While visiting her mother in Denver on the way to Lake Tahoe, where she worked as a restaurant manager for a major hotel chain, she bought a Mini Cooper. Her mother is a cosmetologist who has tattoos done by (tattoo artist named here), etc. 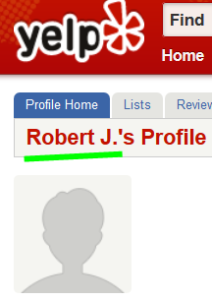 Yelp profile photos can be searched through Google images to find a match at other websites. Or you may get enough identifiers on Yelp to find profiles on Facebook, Twitter or Instagram. Search creatively, as one must in the realm of online research. This entry was posted in Research Methods, Social Networks. Bookmark the permalink. « How Do I Search Craigslist?